Debut author Zenz offers a poetic rewrite that aims to make Scripture more accessible. For readers who find Scripture too difficult, too long, or too boring, the poet aims to remake it in easy, contemporary verse. It’s a great idea, if a hard one to pull off. Zenz admits the religious challenges: for the devout, the Bible is sacred, and adjusting its message, whether by intent or by mistake, is seen as sinful. 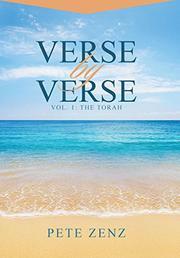 However, this book, which focuses on the Torah, sometimes seems to ignore these pitfalls. Indeed, the Bible is not only spiritually significant; it’s one of the pillars of world literature, and rewriting it is akin to rewriting Shakespeare. The troubles start in this book’s first lines of Genesis: “In the beginning of the earth, / Of living things, there was a dearth.” It’s hard to improve on the King James Version’s timeless opening, “In the beginning,” so the poet’s foundation is sound. But his addition—“of the earth”—is odd, as Genesis 1 starts out not just before the Earth, but before everything: there are no sun, no stars, no planets, no nothing, so these three extra words are misleading. The second phrase is equally problematic, as its nonstandard syntax—which opens awkwardly with the prepositional phrase “of living things”—sets up a forced rhyme of “earth” and “dearth.” Of course, there are much stronger passages elsewhere, each of which reveals the poet’s skill. One high point is his rendering of the sacrifice of Isaac: “So up Moriah the old man went, / Isaac knowing naught, / With wood and knife and stony flint, / The sacrifice he brought.” Much of the genius of the original Torah comes from its concision, and the poet replicates that effect here, wasting no words as Abraham brings his son to the altar. But it’s hard to maintain that level of quality throughout; as a result, this book serves mostly to remind readers of the Bible’s own poetic genius. An ambitious if uneven effort to update the Torah.